I lost my retainer, how do i keep my teeth straight?? Sometimes, hard as you try to be careful, you lose or break your orthodontic dental retainer. It's very important to wear your retainer exactly as your dentist or orthodontist told you, otherwise your teeth will shift over time. Teeth are dynamic and they do move "by themselves" from the force of your jaws and bite. Even if you go back to your dentist, it can take a week or more to get a new retainer made -- and your teeth can shift in that time. That's where Stay Tray comes in handy to protect your orthodontic investment. 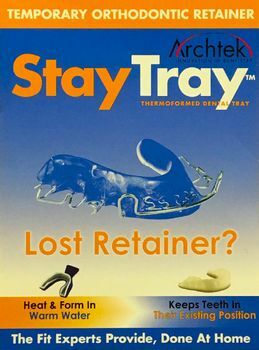 Stay Tray is a temporary replacement retainer that you mold at home in hot water (thermoformed "boil and bite" technology). It uses a patented "two tray system" to help you form the tray properly in just minutes. After forming, you can trim the retainer with scissors for a totally comfortable fit. The Stay Tray makes a white colored retainer, which is suitable to wear at home or overnight. The rigid white EVA material holds your teeth securely in their existing position while you wait for the new retainer to come from your dentist or orthodontist. It is not meant to wear for months on end as a new retainer; it is meant as a temporary replacement so that your teeth don't move while you wait for your dentist to make a new retainer for you. Each Stay Tray kit comes with one tray (which you can use for EITHER the top OR the bottom teeth). If you need trays for both the top and bottom teeth, you need to buy two kits. Each Stay Tray kit also comes with an attractive mirrored black and white retainer case -- the same one that we carry, which retails for $6.50. You can rinse Stay Tray with warm water and brush it with a toothbrush. For more thorough cleaning to prevent smelly bacteria, we recommend cleaning the product daily with Retainer Brite. Stray Tray comes with full instructions and an 800 phone number to call the manufacturer for advice or questions. This product is made in the US by a high-quality dental company. It's a good idea to have one of these on hand, especially if your kids are wearing retainers. You never know when a retainer might get lost or broken. Stay Tray helps you be prepared to protect your orthodontic investment! You get ONE tray which makes a replacement retainer to use for EITHER the top teeth OR the bottom teeth. (If you need retainers for both the top and bottom, you must buy TWO Stay Tray kits). The finished retainer is WHITE in color and is suitable to wear at home and overnight. Form it at home with hot water. Stay Tray can be trimmed with scissors for an individual fit. Rigid white EVA material keeps your teeth firmly in place. Full instructions are included with the product, along with the manufacturer's 800 phone number for questions and assistance. Includes an elegant mirrored retainer case which retails on our site for $6.50. Meant as a temporary retainer while you wait a a few weeks for your dentist to make a new retainer for you. Not meant to use months on end. Stay Tray is a great idea. Whether your retainer was accidentally misplaced or has broken, you won't have to worry about your teeth shifting. Just wear Stay Tray at home and at night to assure that your teeth stay in place, protecting your orthodontic investment. I had to get a partial and thought this would be a good product to have on hand, just in case. . . I gave it a 4 because I love the idea of having 'a fix', just in case. .